"I think most people are bored and restless and accept what they are given, but people are capable of much greater understandings and music is one of the gifts of the gods"
HEARSAY: You've said you were only able to record the songs on Teenager now you felt you no longer had to be the person who wrote them. 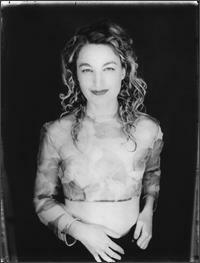 How does the 41-year-old Jane Siberry differ from the 17-year-old one? Are you older and wiser or just different? JANE SIBERRY: Both, really. Different and big enough to obviously embrace that side that I wouldn't have been able to when I was younger. I was older back then. You know that Bob Dylan line, 'I was so much older then, I'm younger than that now'; that's how I feel. There's two different kinds of people: one who gets older and one who gets younger with age, and the key factor to which you are depends on whether you're doing anything that gives you energy or not, something you love or you hate. I happen to be lucky enough to have music. I was in my twenties when I felt really old. In my teens there was just lots of confusion and very few guidelines so depending on what area you live in you reach out through groups of people or books or music to try to sort things out. When I was sitting in the studio waiting for the tape to roll, I would travel back to that time and it would be a very solitary experience, even though I had the usual pack of friends and stuff like that. Solitary then is different than solitary now — solitary then is when you're cut off from the flow between you and the universe because you don't even have spiritual guidelines figured out for yourself and yet you can't accept what you were raised in, you've probably rejected whatever religion you were raised in and you haven't figured out what you do believe in, so you don't even have that feed coming at you. You seem to have effortlessly made a journey from a folksy singer-songwriter to something akin to a song-based modern composer. Does it feel like a journey, and how do you feel you fit into the musical landscape of the late 20th century? Honestly, I do feel more like a composer than a songwriter. I don't say that very often though! I think I'm a good antenna for what's in the air and the more I don't need my defences, the more open I get, the better an antenna I become. So my attraction is composing and an attraction to integrating a lot of things into one piece because people can understand a lot of things all at once and we need that — it's interesting! I think most people are bored and restless and accept what they're given, but people are capable of much greater understandings and music is one of the gifts of the gods, I think. So my attraction to these things is in the air, I'm sure. I just tune into the times — it's my job. You've described your songwriting method as 'tuning into things' before, but where does that leave the artistic process? Is your role that of witness or interpreter rather than creator who conjures things out of thin air? A 'witness' somehow includes you, but definitely everything's being funnelled through an aesthetic which makes me choose blue when someone else would choose yellow from the same information. So it feels totally creative and yet totally like a secretary; both at the same time. How does the technique change when you collaborate with artists like Graeme Revell [on ‘It Can’t Rain All the Time’ from the film The Crow] and Hector Zazou [‘She’s Like a Swallow’ from Zazou’s Songs from the Cold Seas]? Do you bring your own piece of the jigsaw puzzle to fit in or do you have to be very malleable and porous to allow it to be a two-way process? I went to this songwriters’ workshop with a whole bunch of Nashville writers so in one week I had a crash course in seeing how I collaborate. It was mostly a disaster; I felt sick for two days when I came back. I'm really good at stepping in and adding to someone else's core, and I'm really good, I think, at support work. But I'm not very good at going for something and hearing someone else's voices around me — it's like an annoying insect. It just doesn't make sense in my system when I'm listening deep inside. I don't work that way and it upsets my system to try to adjust to that. Graeme Revell… that was adding to him, and Hector Zazou, I just sang the vocals and he did his diddly thing with it. That was nice. Margaret Atwood's style was once described as 'Intensity combined with sardonic detachment'. Given that you seem to have a great affection for the characters who people your songs yet occasionally raise an eyebrow at their behaviour, do you consider this equally applicable to you? No. The difference is 'sardonic’. That suits her writing I agree, but I don't think it applies to me. I don't know what word does. I'm not a big fan of her writing to tell you the truth — although I know the point of the question isn't to talk about Margaret Atwood! When I read her stuff, I'm always saying to myself, 'so what? so what?’ What's the point of hitting that hot spot for people and then deserting them? It's unusual for an artist to come from a scientific background: you've studied microbiology to degree level and even teach a course in Basic Science. Are the worlds of art and science complementary to you and do you think your grounding in science gives you a different perspective on the world which those immersed in the humanities lack? Well I did learn how to learn. After three years I finally stopped rounding off numbers. I would fail my tests because I'd say, 'It's, oh, roughly two [units] from one side of a cell to the other' when, you know, It's '2.436'. I trained my mind to be more precise. But more importantly I rejoiced in the sciences because I no longer had to count on other people. I could understand the physical universe myself and reduce it to its elements and then build up again to perhaps understand things that I'd never heard explained but which I needed explaining. That was my joy: thinking that maybe I wouldn't be so blind. A window opened and it was very exciting. It hasn't made me more analytical — I was already questioning. But it confirmed the connection between science and the arts: there's an aesthetic and a joy in both. It's just as fulfilling and moving to follow through a calculus formula to the end, and it's the same with running Sheeba. It's the same aesthetic as writing songs: there's a great flow of energy, you manipulate it until things pop and then the less important things drop away and there's joy there — it's the same aesthetic, it's all connected. And then, out of the blue, my math teacher from grade 13 contacted me — this is one of the gifts of the Internet — and I had tried to find him for years. It felt like a cosmic hand — now that I'm teaching this course, he's going to help me with it. He's the teacher who would weep at the end of math classes and we would weep along with him, tears of happiness because it was the most beautiful thing we'd ever seen. He was the one who brought me to that understand­ing first, and then later I took a degree in science. You were talking a lot about time running away from you at your concert last night and you seem to map out time on your records with your one- and two-minute silences. Do you think you're conquering time, or is it conquering you? Oh, that's a playful question! I can't answer that. You've seemed enamoured of the way your songs develop and grow and seem to have a life of their own. You've likened Barkis Is Willing to a river with tributaries and songs like Ingrid And The Footman and Love Is Everything exist in different recorded versions. Do you ever hope to attain a definitive version of a song or is the state of flux an end in itself? Do you like the fact your songs exist in different forms? Yeah, I think that's really important and that's something I can do with Sheeba. You know, Warner Brothers… with Maria I said, 'it's a live record — live in the studio — and it's obviously not what you want. That's fine: I'll give you what you want. I'll do a companion EP and I will extrapolate four or five dance mixes from it except they won't be like reductions of the songs, I will take small bits of them, the hooks — there are so many hooks in Maria — and create new songs out of them. Then I can extend the story so they actually enrich the song. And then I had a book to go with Oh My My: all of these things were taking something and creating a new version of it. But Warner Brothers, 'Time-Warner': they have books, they have film; all of these things I'm perfect for, but they don't know how to work with someone like me. But I know how to work with someone like me — so that'll probably be a big thing with Sheeba, to work that way more. I don't know why it's important to me to work that way but it feels important. Ingrid And The Footman doesn't count though — those are just dumb edits! All of your albums embody different styles distinct from each other. When writing songs, is the sound intrinsic to them? Or do you write them and, once you reach the studio, decide something will be synthesised, or very acoustic, or whatever? I've gone both ways but often I'll have the tone of a record in mind and then the songs will be written around it. With When I Was A Boy, I almost left At The Beginning Of Time and Love Is Everything off because they were out of that tone I was writing — Temple was closer to it and Sweet Incarnadine — that darker tone. Often it's a tone set by maybe one song which gives me the idea that that's going to be the next record and then I write around it. But sometimes I'll have songs, take them to the studio and pull out elements until they blend. When I Was A Boy was four years in the works, in stark contrast to Teenager which was recorded In a couple of days. Why did the former take so long and were you satisfied with the finished result? Didn't it go through many stages when it became different kinds of albums? Yeah it did, but I didn't really work on it for three or four years. I worked on it probably in three or four spurts and that was because the record company held me up and that was because the universe was directing the record company to hold me up. I had a lot of downtime which I hadn't had for years so that's when I started to look for things to do and started to direct my own videos 'cause I was so restless, do a lot of other creative things and also work on myself as a human being. So I didn't really work on it for a long time. I hope if I had worked on it for four years it would be way better and way more songs — it's only like nine songs; 'my goodness, whatever else are you doing with your life?' But, yeah, there were three or four different versions. A great fondness for nature and rural life spills out of your writing yet you've always seemed city-based, first in Toronto and now New York City. Is there a tension between the urban and rural for you? Do you need both equally? You answered the question: you're right - I need both. It's even more extreme now I live in one of the most extreme, energetic cities. I spend more time in northern Canada in a trailer in the middle of nowhere with no water and no electricity. My needs are wider. I have to go back and forth, and it's really important to have both. How was Toronto as a place to be an emergent, highly idiosyncratic artist? It seems to have produced a wealth of talent, even if it’s often much-maligned as an uninspiring place by those very artists it’s spawned. Is it? I was inspired by it, but now when I go back to it I find it very soft and flabby. But I'm not in the scene now, I'm not cutting my teeth there any more, so it is flabby to me. Toronto's a good place and I go back there for something I can't get in New York. There's some kind of food in the air. Do you think there's anything quintessentially Canadian about your work? Can you imagine following the same path if you'd been born and brought up in NYC? Canadians don't think of me as Canadian! Oh, maybe they do. They keep including me in their encyclopaedias and stuff. I don't know if I'd be the same person. My temperament would still be attracted to nature, I'm sure. Someone who grows up on a farm can be dulled to nature and then you go on a school trip to Old MacDonald's and you see the whole natural world in a flash. In New York I might've been tougher, less soft, as a young kid. It depends where you grow up — if it was in a tough neighbour­hood, maybe I wouldn't have the greater understanding I do now, having grown up In the suburbs where most people grow up, rather than in inner-cities. Most people who grow up in the suburbs are depressed and have a greater struggle to burn off that depression. I'm grateful for that now. If you were dropped into the middle of a circus, what circus skill would you take up in order to survive? One of the things which makes your music universally appealing to a broad audience and so different from the work of most songwriters I can think of is the way you tackle themes fundamental to existence: life, birth, the mother-child relationship, spirituality, the struggles of being alive. Are you consciously trying to address questions of the human condition, and have you found any answers? No, I'm not. I don't feel like I have a job to ask for other people. Everything I write about is organic and from me. As a matter of fact I have a very clear line which I would never cross, or that I crossed maybe in my younger days which would make me not like the songs now. Which is often why you don't like your writing when you're younger, because you expand before you should. No, I think of myself as pretty low-falutin'. The band you were performing with last night — vocals, piano, trumpet — was a very pared-down line-up yet one of unexpected volume and strength. How did you discover the combination? Partly the line-up last night was just related to expense. I would've brought bass and drums and one more vocalist ideally, I'm really leaning toward that wall of sound thing right now. But we couldn't afford to bring all those people so we went with four people and then something new and really special came out of that. David [Travers-Smith], the trumpet player, plays like a vocalist, blending-wise, vibrato-wise, and the way he hears harmony — a lot of singers don't hear it the way he does so it's not as much fun to sing with them. And Rebecca [Campbell] is just an amazing singer — I can change on a dime and she's right there. We'll never know — it shocks me to see how fast she is. And Tim [Ray] is that way, too. And at this point in my career, finally running into people who can work that way is a huge feeling for me. Tim is scary — he can just play one note on the piano with no harmony, just a single note, and it's electrifying, I don't know why, it's just amazing. Usually you need two notes to let you know if it's major or minor or whatever, but he can move me with a single note and I'll know right away what to sing. So how was it to work with him, particularly on Maria, when you're a pianist yourself and so used to providing your own keyboard parts? Did he bring many things to the songs which would never have surfaced if you'd played the piano yourself? Oh, absolutely! I could never go where he goes. But the thing is, I can hear it in my head — that's why we're so hooked up — but I can't hit it. And yet there are some things I can do that he can't do, it could be a simple thing like a harmonic thing — so I still try to be involved a little bit especially in the studio. Yeah, but I've only become that kind of singer lately — I'm still learning to sing. If I'd found Tim five years ago. I wouldn't have been able to match him. Now I feel like I can — on a certain level anyway. What will occupy the next few months of your life?